60-Minute Special In Color On Film. Filming Location: Los Angeles, CA. Filming Dates: January 21-28, 1997 at $1,000,000. Original Air Date: ABC Television Network, Monday, February 17, 1997, 8-9 P.M. (EST). Home Video Releases: Not yet!! It�s 30 years later and The Monkees are still living in their beach pad still trying to make it big having still made episodes of the TV series all these years and are now up to their 781st episode, trying to dodge oncoming plotlines. David is still the same guy who gets stars only now they come out of his ears (leftovers). Micky is still inventing and is now working on his latest invention, a drink that makes someone vomit sparkles as a gimmick. When he answers a door to a lawyer how is claims the Monkees can inherit an estate of an recently deceased millionaire if they spend the night at his mansion which is considered haunted. However, the Monkees decline since they did that episode already (episode 186) but Micky offers the lawyer his drink and upon closing the door he hears the lawyer regurgitating. As The Monkees gear up to perform at one of the most prestigious country clubs in the city, they are discussing whether to do a gimmick and make several suggestions including becoming the world�s first throw up band to Michael�s Tasmanian Kabuki impression (spinning in a cyclone like The Tasmanian Devil!) and Peter�s impression of Donald Duck�s temper tantrum and becoming pro wrestlers (literally) but no one agrees with any of these suggestions. Then David opens the refrigerator only to find small people touring around memorable collections of The Monkees including the first TV dinner. They�re about to rehearse, when a young woman barges claiming that guys with cell phones and black gloves are pursuing her but David informs her that they did that episode already without the cell phones. She makes another suggestion of waking up with no memory with a note that says return to sender, but the guys aren't satisfied and have to rehearse although they allow her to invite a crowd of people to come in and listen. Then they perform �You And I� to which a musical sequence shows them in an ice skating rink in winter coats as ice skaters skate away. Back to reality, they prepare to rehearse �Last Train To Clarksville� when they hear the laugh track which is broken and David shuts it off. Then the scene is intercut with footage of a lizard sunning itself on a rock twice which Michael claims is stock footage added since the show doesn�t have enough film to accommodate the budget. The guys then decide to go out to the beach as David secretly turns on the track machine which this time swells to the sound of a standing ovation in which he indulges before being dragged away by Micky. At the beach, Michael and Peter briefly do some of their old Monkees shenanigans by running to the coast on the beach only before being chased off by the incoming water! While on the sand, the others are shocked to learn Michael turned their Monkeemobile into a low rider and a dimension machine. Micky even has a fantasy sequence of a museum guide as he introduces The Monkeemobile. The Monkees indulge in some more Monkees shenanigans just before deciding to rehearse again as they spot a stage with instruments right on the beach to which they perform right there and soon there�s a video sequence to an updated tune of their classic song �Circle Sky�. Later on the beach, The Monkees comfort a little boy who is wailing over his pet pig being sold for bacon. Micky thinks it�s a good storyline but Michael reminds everyone that that�s been already done, only it was a calf. He then tries to cheer the boy up by giving a moving closing monologue from the classic Grapes Of Wrath but it only makes the boy cry even louder. Then David does a song and dance �Gonna Build A Mountain� but still to no success; Micky intervenes and offers to show they kid his throwing up sparkles which cheers the boy up so much that he soon rushes off to get his friends forgetting all about his pet pig. As The Monkees stroll along the sand, they debate whether to do a storyline to add tension and drama but Michael points out that there�s nothing wrong with just hanging out and having fun since they�ve been doing it for years although a good storyline comes along once every five years or so. Then the stock footage of the lizard returns. David still insists they need a storyline but Michael claims they only need to simply play their music and as if on cue a piano appears right on the beach to which Peter plays and all of them sing �Antarctica� which involves a fantasy sequence of them dressed in winter coats in snowy Antarctica playing on the keyboards. Later that night, The Monkees are in their pad dressed in tuxedoes preparing for their gig while outside a teenage girl tells her date a scary story of four guys who moved in the pad and went crazy and never moved out to scare her date into kissing her! Micky then gives a lecture to the audience about practicing safe kissing. En route to the club in The Monkeemobile, Michael shows them each of the dimension devices to the car including one that changes them and everything else a hundred yards away back into the 1960s. The last device changes things into different objects and not just inside the car (very Monkees). Michael then allows Peter to take the wheel (literally) since he�s tired. When they arrive at The Country Club, the guard won�t let them in at first until David dolls up as Ethel Merman and does a song and dance impressing the guard who still refuses to admit them since women aren�t allowed to wear pants. David rips off his pants showing off his lovely legs to the guard. Then the guys decide to rehearse one last time on stage and soon do the number �Regional Girl� as a black-and-white video sequence of The Monkees with a group of female models appears. 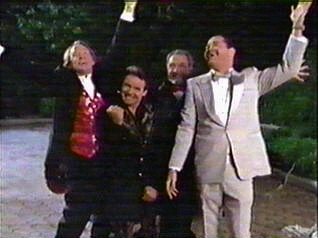 Afterwards, the guys meet Chuck, the club manager and his scatter-brained daughter Princess who needs the Monkees' performance to do well in order to save the club but the guys see it as another attempt to get them to do a storyline. They question if the Monkees will play their greatest hits but they insists of promoting their latest CD and in another fantasy sequence there�s a Home Shopping commercial with the phone number 000-Mick3y where Peter introduces his psychic perfume before introducing his guest Davy who shows the poster for their latest CD Justus and Micky as Martha Stewart. Back to reality, David chats with Princess about songs they�re going to do and just like in the classic episodes she gets stars (literally) in eyes they glance but also grapes, bananas and other fruit and hot dogs come out of David�s ear, which invokes another return of the stock footage of the lizard! Micky tunes his drums with a stethoscope when he spots the little boy with his friends outside the club near urging him to throw up sparkles again. When he does, the lizard footage appears and they realize that is what causes the lizard footage to appear. Then Chuck gives a brief introduction before The Monkees are on stage performing their classic hits in front of dancing crowd consisting of �Last Train To Clarksville�, �I�m A Believer�, �Daydream Believer�, �(I�m Not Your) Steppin� Stone� and �Pleasant Valley Sunday� while their instruments turn into different objects courtesy to the kids outside playing with The Monkeemobile dimension device and flashbacks from their classic episodes appear. After their performance, Chuck thanks The Monkees and announces that he doesn�t have to sell their club and Princess praises them being just as stupid as they ever were now that they�ve grown up. While driving home Peter plays with the dimension device as they declare that their show, like many others, will never go away and will continue forever even when not broadcasting. They return to their pad to find it covered in toilet paper but Peter seems to like it. Micky decides to wrap things up by throwing up more sparkles since their budget is just about used up, and it will wrap up the whole show and as he does they show literally ends with a bang with fireworks. The Monkees returned to television Monday night, February 17, in an ABC network special that finds them still living in The Monkees Pad at the beach, still trying to make it big. The premise is that the guys have been making episodes of their TV series all these years, and now they're up to Episode #781. "I wonder if the general public knows that TV shows like ours never die," Micky muses in the special. "They just go on and on even though they're not being broadcast." This episode finds the guys purposely trying to avoid a plot. After all, after 780 episodes there aren't any plots that haven't been done! But right from the start they're continually tempted by storyline suggestions. Micky opens the door to a lawyer who says The Monkees could inherit the estate of a deceased millionaire if they'll spend the night in his haunted mansion. (In a nod to Monkees history, the lawyer is played by Jon Brockman, the "head" in the ads for The Monkees movie HEAD!) The Monkees decline his offer - "Oh, we did that one, already!" Later a fan (Davy's daughter Sara Jones) bursts into the pad toand asks the guys to help her escape from her pursuers, guys with cellular phones and black gloves. "We already did that one," Davy says. "There was no cell phone," Mike points out. Still later the guys find a kid crying on the beach because his pet pig is being sold to become bacon - "We did that," Mike says, "but it was a calf." (Actually, it was a horse.) Eventually the guys end up saving the country club by making a success of their gig there, but, still trying to avoid a plotline, they do do with a minimum of involvement! "Once every five years or so a good storyline comes along," Mike tells the other guys, insisting that The Monkees don't need a story "as long as we're having a good time. All we need is music." Micky is convinced that The Monkees need a gimmick to make it big, and so he is constantly inventing things - this time a potion that makes the drinker throw up psychedelic confetti and sparkles (or, as Peter calls it, "magic Monkee dust"). It turns out to be a hit with the 8-year-old set, a nod to the appeal The Monkees' TV show has always had for kids and teens. Davy is still the same guy who used to get stars in his eyes, but sometimes the stars come out of his ears! And sometimes the stars are hot dogs instead! This time Davy exchanges starry-eyed glances with The Princess Entwines, the daughter of the country club manager - she is played by Davy's real life girlfriend Gillian Holt. Mike has turned The Monkeemobile into a lowrider and dimension machine, amd Micky begs him to change it back - "It's our special thing!" As the guys drive to the country club gig, Mike demonstrates the different dimension functions, which come into play later when Micky's 8-to-10-year-old fans take control of the dimension machine during the guys' country club show, conjuring up Monkees clips from the 1960s and turning their instruments into some very strange objects. Music videos include "You And I," "Regional Girl," and "Circle Sky" from the new Justus album. "You And I" is a performance at an ice rink, "Circle Sky" has visuals that bring to mind Nez's Television Parts, and "Regional Girl" is a visual take-off on the well-known Calvin Klein ads. The guys also do a little harmonizing on Bill Martin's "Antartica," and Davy sings a few bars of "Gonna Build A Mountain," his solo number from The Monkees' '67 tour. The Monkees' beach pad set was rebuilt for the special but only appears in about one-quarter of the show. Familiar decor like the "Money Is the Root Of All Evil" sign, the bus stop sign, and the large "4" on the wall is combined with new touches like a microwave oven, a computer, and a new refrigerator complete with a miniature tour guide (Nesmith's pal Bill Martin) and tourists. A reproduction of surrealist artist Rene Magritte's famous "This is not a pipe" painting hangs next to a photo of The Monkees with the caption "This is not a band." One of Nez's favorite Monkees parallels in interviews in the last year has been that "Magritte taught us that a picture of a pipe is not a pipe," and so a television show about a band is not the same thing as a band. Familiar images from The Monkees TV series are also recreated---the scene of Mike and Peter running down to the beach to the waves and beating a hasty retreat, the guard who won't let them into the country club---and just like The Monkees TV series, it's inevitable that one of the guys will end up in drag. This time it's Davy who dresses as Ethel Merman to get past the guard at the country club. Not even Mike Nesmith's green wool hat escapes mention, but Mike is quick to point out, "I haven't seen that hat in 25 years!" The opening credits of the special are an updated version of the old TV series's credits, with new clips from the special and footage from The Monkees' November reunion show at Billboard Live edited together, quick-cut style, and a newly recorded version of The Monkees' theme. Closing credits features the guys' faces from both the '60s and '90s. Perhaps Michael Nesmith was going for some deep examination of The Monkees' phenomenon in his script about plots, gimmicks, clich�s, and surrealist painters, but he gives Davy the best, truest line of all: "We're The Monkees. That's all we need to be." The working title for this special was "Hey, Hey We're The Monkees", a.k.a. "A Lizard Sunning Itself On A Rock". ABC, which aired the special and, in fact, chose its title, aired repeats of original episodes of The Monkees on its Saturday Afternoon schedule between September 1972 and August 1973. 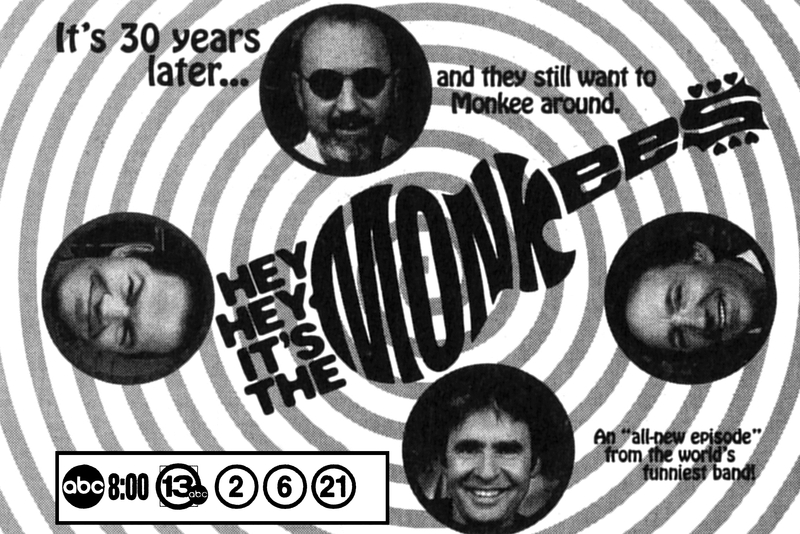 The origin of the new special generated in November 1996, when The Alphabet Network, fueled by strong publicity on The Monkees and their 30th anniversary, contacted Monkee manager Ward Sylvester with interest in making "a Monkees retrospective." Ward agreed, but declared that "we have a better idea." The rest, as they say, was hysterical. The Monkees filmed the "You And I," musical number at an ice rink, the practice site for The Los Angeles Kings hockey team. "Antarctica," a little Bill Martin-composed ditty The Monkees are seen performing in the special, previously appeared in a 1980 Pacific Arts comedy video An Evening With Sir William Martin, wherein Michael Nesmith appeared as Foyer The Butler. The inclusions of both "For Pete's Sake" and �Daydream Believer� above are for reference purposes only. Presumably, as both are short instrumental inserts, neither have any direct Monkee involvement and are products of Mischa Segal's musical talents. Indeed, BMI files record the two compositions as simply "Hey Hey It's The Monkees - BG Cues." "Soap And Rope" (Jones/Segal/Bricusse/Newley), heard in the scene where David consoles the kid crying on the beach, is a tongue-in-cheek, half-minute rewrite of the standard "Gonna Build A Mountain" (which David himself performed during the groups' 1960's concert set). And "Davy Or Ethel (Dance With Me)" (Segal), the third of the comic musical inserts, is David's Ethel Merman parody. 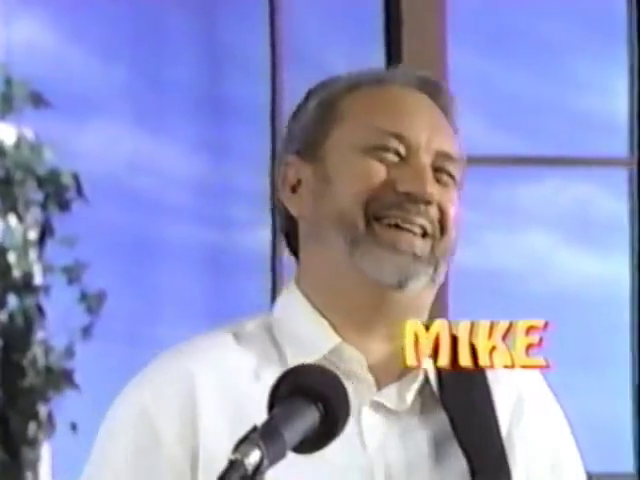 Michael Nesmith is the second Monkee to write a Monkees celluloid project (after Micky Dolenz's co-written teleplay "Mijacogeo" [a.k.a. "The Frodis Caper"]) and the third Monkee to direct (following Dolenz's "Mijacogeo" and Peter H. Thorkelson [Tork]'s "The Monkees Mind Their Manor"). 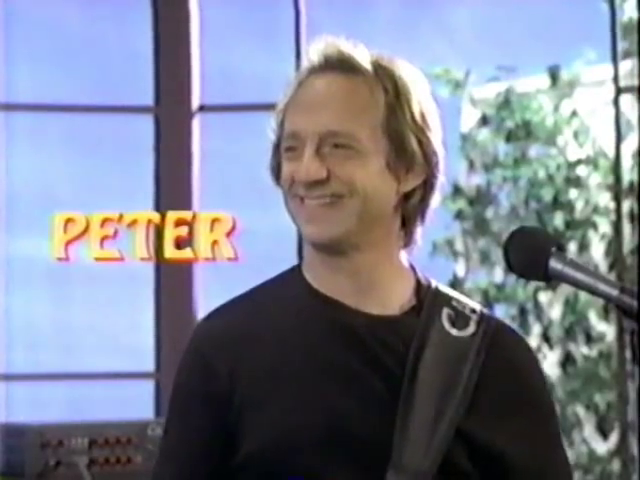 "You And I" is the third Monkee song used as a Monkees TV closing theme, following "For Pete's Sake" (the second season end title) and the �(theme from) THE MONKEES� (the first season end title). �(theme from) THE MONKEES�, in fact, was cut for the sixth time for the special Hey Hey It's The Monkees. Previous recordings had been of a demo by its composers Tommy Boyce and Bobby Hart for the unaired 1965 pilot, another demo cut by Boyce, Hart and Micky Dolenz in early 1966, the version for the first album in July 1966, the one for the TV show in August 1966, and the one in Italian, "Tema Dei Monkees," in summer 1966 and March 1967. 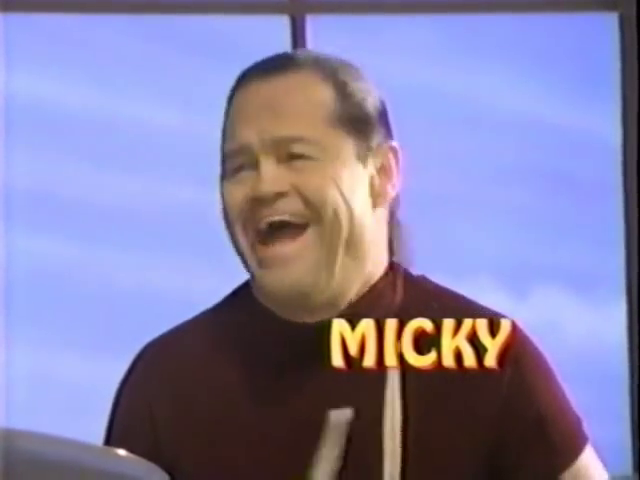 Micky Dolenz's song "Regional Girl" underwent a few lyric alterations in order to appease ABC Broadcast Standards & Practices, replacing lyrics The Alphabet Network deemed unsuitable for the 8:00 PM family hour. Hey Hey It's The Monkees was aired simultaneously in Canada in adjointment with City TV and MuchMusic. 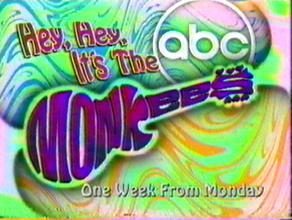 The 8 PM February 17, 1997 airing of Hey Hey It's The Monkees was a lead-in to the network telecast of The 11th Annual American Comedy Awards on ABC; its competition was Jeff Foxworthy and Mr. Rhodes on NBC (The Monkees' old network), Cosby and Ink on CBS, Melrose Place on FOX, 7th Heaven on The WB, and In The House and Malcolm & Eddie on UPN. The Monkees special ranked #73 out of 106 shows for the week of February 17-23, 1997 on the Nielsen ratings with 10.3 million viewers tuning in and turning on, which sent sales of The Monkees 4-man album Justus (R2 72542, released October 15, 1996) rising considerably (though not enough for Billboard chart status). In the scene where The Monkees try to console the Young Guy (James Williams), Michael takes a cue from the closing speech by Tom Joad (Henry Fonda) in The Grapes Of Wrath (20th Century-Fox, 1940). As Michael demonstrates The Monkeemobile's different dimension functions on an 8-track deck, vintage Monkees clips from the 1960s can be seen. Those include clips from the second season main title sequence; original TV episodes of The Monkees No. 5, �The Spy Who Came In From The Cool�, 14, �Dance, Monkee, Dance�, 29, �The Monkees Get Out More Dirt�, and 37, "Art For Monkee's Sake"; the 1968 Columbia Picture HEAD (the �Porpoise Song�, �Circle Sky� and �Can You Dig It� musical sequences); and the �Daydream Believer� musical number. Also, obvious Monkees episode references abound: No. 2, �Monkee See, Monkee Die�, No. 8, �Don't Look A Gift Horse In The Mouth�, and No. 10, �Here Come The Monkees� (Original Pilot Film). Hey Hey It's The Monkees was the first network TV showing of the original Monkee quartet since the 1969 TV special 33 1/3 Revolutions Per Monkee---as well as, sadly, the last. On a rather Unpleasant Valley Wednesday, February 29, 2012, original Monkees TV cast/band member David Thomas Jones succumbed to a massive coronary on his ranch in Florida at the age of 66. Interestingly, this and the preceding 33 1/3 Revolutions Per Monkee both were the last televised original appearances of The Monkees as a quartet. Supervising Producer Ward Sylvester, closely involved with managing The Monkees' 30th Anniversary tour at the time, was the only member of The Monkees' TV crew to be closely involved with all of their televised projects thru the years, including Associate Producer (and later Producer) of their 1966-68 NBC-TV series and Executive-Producing their previous TV special, 1969's 33 1/3 Revolutions Per Monkee, also on NBC. (Needless to say, he did not participate in production of their 1968 feature film, HEAD.) Sylvester passed away June 11, 2017 at age 77.